The aircraft carrier is truly a marvel of science and engineering. I’ve had the chance over the years to talk to pilots who flew off aircraft carriers and they always have the same attitude. There is nothing normal about taking off or landing on an aircraft carrier. There is no autopilot mentality. There is no familiarity. It’s not “another landing at Logan” attitude. Your plane is catapulted into the air and over the sea for take off. It’s not a lift off so much as you’re slingshotted into the sky. When it comes time to land, your runway is a dot in a big blue ocean that’s moving. And if you if your plane’s tail hook misses the cable, you might not stop at the end of the runway and end up in the water. 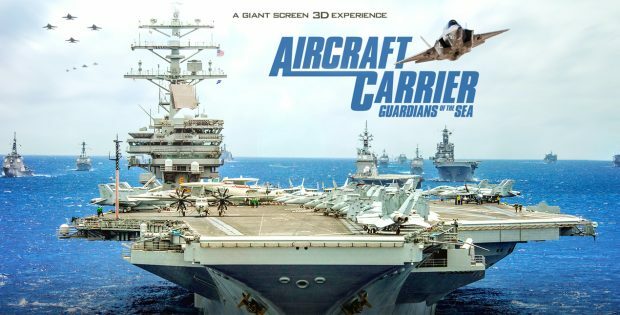 Aircraft Carrier: Guardian of the Seas is an IMAX film that brings these largest of naval vessels to the largest of motion picture formats. The filmmakers tag along with the USS Ronald Reagan during the RIMPAC maritime training exercise with international support. Even with dozens of ships, nothing comes close to the massive size of the aircraft carrier. The film gets a bit more indepth in the details of what goes on to make an aircraft carrier work. They show us how the deck crew walk the runway looking for the slightest object. Turns out even a tiny screw can get sucked into a plane’s engine and cause disaster during talk off. We get a taste of how the latest helmets for pilots keep track of so much including the nationalities of the other planes in the air. The computer can tell the difference between a whale and a submarine. It can also select the weapon to use against a targeted enemy. Narrator Maurice Dean Wint (Hedwig and the Angry Inch) keeps track of everything for the viewer. There is a bit of history displayed including the Battle of Midway when US forces risked sending out their planes on what could have been a doomed mission only to come back having sunk numerous Japanese aircraft carriers. They show off the new generation of aircraft that can land vertically so they no longer have to fear ending up in the drink. There’s a quick visit with the numerous support personal that run the carrier. It’s an airport on the waves so much support is necessary along with support for that support. Aircraft Carrier: Guardian of the Seas gives a sense of the majesty and importance of this navy vessel. It’s the perfect gift for the ex-Navy veteran in your life who owns a 4K TV or a way to hint that they need to upgrade their TV set. The video is 1.78:1 anamorphic. The resolution really gets you into the spaces on the carrier and the aircraft. The audio is English Dolby Atmos. DTS-HD MA in French. Things can rumble during takeoffs. The movie is subtitled in English. Blu-ray and Digital Download of the film. Audience Testimonials (4:40) has people talking about seeing the film. F-35 vs. Bugatti vs. Human Cannonball (1:12) is a quick physics lesson using CGI. The plane using the catapult can hit 170 mph in 3 seconds. Usain Bolt vs. Giraffe vs. Nuclear Carrier (1:07) is another CGI dash. This one has a varied outcome. F-35 Navy Selects Reel (3:20) gives more detail of the plane during landing and launch. Aircraft Carrier Trailer (1:43) & TV Spots (1:00) reminds us that this is a city at sea. Shout! Factory presents Aircraft Carrier: Guardian of the Sea. Directed by Stephen Low. Screenplay by: Stephen Low. Starring: Maurice Dean Wint. Rated: Noth Rated. Running Time: 43 minutes. Released: February 5, 2019.